So how long would it take a human, today, to walk the path that humanity traveled? Paul Salopek, a prize-winning journalist, (including a Pulitzer for his article about the Human Genome Diversity Project) and National Geographic fellow is going to find out, if it’s even possible. According to Paul’s calculations, it will take him about 7 years to walk from the Garden of Eden, Herto Bouri, a village in Ethiopia’s Middle Awash valley, which has the longest and most continuous record of human evolution of any place on Earth, to the southern-most tip of South America. Paul left yesterday, January 10, 2013, so only another roughly 6 years and 364 days until his arrival. But then again, I’m thinking it’s not so much about the destination as the journey. 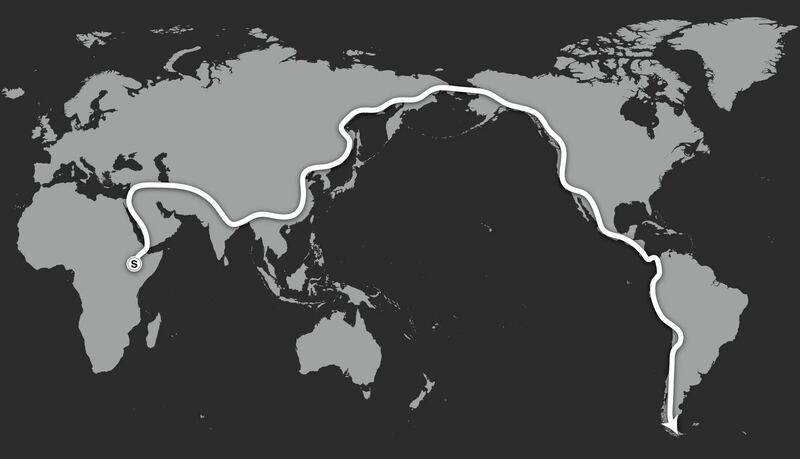 The map, below, released by National Geographic, documents the path Paul will take. This same path, taken in essence by ancient humans, took 30,000 to 40,000 years, depending on the timeframe used for humans leaving Africa and arriving at the tip of South America. Of course, they didn’t have a nifty map, most of them didn’t make it, as the path then was entirely by trial and error. What Paul will accomplish in 7 years, it took ancient people between 1200 and 1600 generations to complete. Click on the “follow” tab to sign up for e-mail notifications when Paul posts something interesting. Under “The Storytelling” tab, be sure to watch the short video about Paul’s inspiration for making this epic journey. This entry was posted in Genographic Project, Population Genetics and tagged General Information by Roberta Estes. Bookmark the permalink. Isn’t it a fact that when ‘man’ left Africa on his journey, the continents were not separated as they are today but either much closer together or in fact joined? This is an outstanding project. He should be passing out DNA test kits along the way to indigenous folks that he meets. Does anyone know what this marker show? The only value with special meaning is 9 and some have suggested 10 as well for Native American heritage. Otherwise, no signifigance. I, too, have a D9S919 17-17 marker value. Which next test do you suggest to prove American Indian heritage. Names, photos, census, oral history all confirm probability but family would like genetic proof if possible. Thank you. Thank you for posting this. I’ve already signed up to follow him. Sounds fascinating! Roberta, please correct me if I am not thinking straight, but genetic genealogy would espouse evolutionism, so why is Paul starting his trip in the garden of Eden location which is Biblical, and the two contradict each other . As well, you title your bon mots “Out of Eden – Retracing the steps of humanity”, which seems to me the same contradiction. Does the Bible indicate the garden of Eden was in the time frame of 30,000 years ago? Just an old lady asking for elucidation….. Many thanks for all of your great blogs. Obviously he is mixing and matching to allow his catchy title. Traditional Biblical study has the Garden in Iraq anyway, so this village in Ethiopia is clearly from an alternate tradition. My impression was that this location was chosen as the start location because it was the oldest continuously inhabited location – therefore was functionally “Eden.” But maybe I was reading too much into it.